Questions about mental health and wellbeing are normal. We all have them because we all want to overcome obstacles to live well and thrive. Question and answer forums can help us sort things out. For this reason, I’ve launched the weekly Wellbeing & Words Q&A Show on YouTube. I also write novels, stories that show characters—representative of real-life people—dealing with mental health challenges or loved ones that have such challenges. These stories can answer questions you might have and address topics you need or want to know about. Bringing the characters and stories to life not just in the books but here on the Wellbeing & Words blog can address common questions, too. Here, characters have a chance to explore questions and concerns and to share them with you. Today’s question comes from Brian Cunningham, protagonist of My Life in a Nutshell: A Novel. At age 37, he’s seeing a therapist for the first time in his life (he doesn’t want to do so, but his mother made the appointment). He has debilitating anxiety and would like help, but he’s nervous and afraid. When at his first appointment his therapist, Dr. Beth Greene, wants him to take an test, he has concerns. Why Do Therapists Use Tests and Inventories? Part of therapy can involve the use of assessments, especially at first so therapists can learn more about the client and the symptoms he is experiencing. This helps focus treatment. Naturally, many people are nervous about the idea of being tested, including Brian. Brian: Is it a test? Dr. Greene: It’s an assessment, so kind of. I hate to think of it as a test, though, because unlike tests, this doesn’t have right or wrong answers. It’s technically called an inventory because that’s more accurate. It’s a record of traits that apply to you. Every single person is different, with unique traits. This inventory helps people identify and understand them. Brian: Yet again, I don’t know what to think. It’s reassuring to know there are no right or wrong answers, although I have the distinct feeling that I’ll manage to do it wrong anyway. After I settle into a chair, Dr. Greene puts the booklet in front of me and grabs a pencil from the cup in the center of the table. I glance at the booklet. The front cover prominently displays “MMPI-2” above the words ”Minnesota Multiphasic Personality Inventory 2.” There are other words, too, but I can’t read them because they’ve blurred and are floating around on the page as the room tilts. I shove the booklet away and leap to my feet. I have to brace my hands on the surface of the table for support. Dr. Greene: I’m so sorry that I didn’t explain the name of this inventory before plopping it down in front of you. Personally, I think that the name is misleading. It’s not a personality test the way people think of personality tests. It really is just a grouping of traits. It helps me learn about people so I can work with them better, and even more important, it helps people understand themselves. This can be used by us to look at some things that might be causing you some difficulties, and that can help us plan some things to do. That’s it. This isn’t a judgment of who you are as a person, Brian. The idea of mental health testing in therapy makes many people nervous. Are these pass-fail types of tests? Do they pass judgement? Do they assign permanent labels to people? These are legitimate concerns that deserve an answer. When done correctly, tests are used the way Dr. Greene used the MMPI-2 with Brain: They gather information. 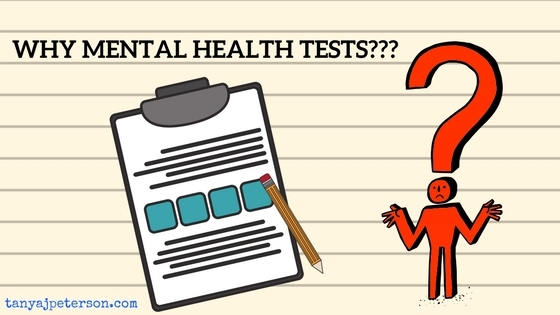 Mental health tests are communication tools, allowing the client to express concepts to the therapist and allowing the therapist structured ways to talk to the client. The results of any test are used by both counselor and clients to better understand problems, choose the best treatment options, and set goals for overcoming difficulties. Mental health testing increases understanding. It can also be a map guiding you toward your own ideal destination. Pausing for mindful reflection on your year can help you end 2018 well, content in the now, which will carry you into 2019. In the wake of holiday stress, many people begin thinking of resolutions for the new year. That's a great practice to make the new year yours, as it gives us a sense of control over over what our year will be like. This reduces anxiety, powers through depression, and gives us the upper hand in our relationship with mental health. So don't discard the ritual of creating resolutions, but don't start them quite yet. There's still time to finish 2018 off strong. previous post: Are My Racing, Obsessive Thoughts OCD?